Quantitative real time PCR (qRT-PCR) is an efficient molecular technique that used to study gene expression due to the advantages of high sensitivity, specificity, reproducibility and broad dynamic range (Tricarico et al., 2002; Bustin et al., 2005; Kubista et al., 2006). In order to obtain the results of gene expression reliable and with biological significance, suitable reference genes need to be selected in different experimental conditions. The ideal reference gene should present a relative stable mRNA expression pattern and also should be minimally regulated under different treatments (Nicot et al., 2005; Araya et al., 2008; de Boer et al., 2009). These most commonly used reference genes included 18S ribosomal RNA(18S), cytoskeletal protein (ACTB) and glyceraldehyde-3-phosphate dehydrogenase (GAPDH) (Suzukietal.,2000). However, some studies have indicated that the expression of these genes can vary at different development stages or external treatments (Bustin, 2002; McCurley & Callard, 2008; Kortner et al., 2011). Consequently, other housekeeping genes, such as tubulins, albumins, cyclophilin, micro-globulins, ribosomal proteins, ubiquitin (UBQ), although less common used it might be, have also been described and recommended to be reference genes in specific experimental treatment (Thellin et al., 1999; Morga et al., 2010; Zheng & Sun, 2011). Recent studies showed that most of the reference genes could also change the expression levels under internal or external factors, so there was no universal internal control gene that can be applied for normalization of gene expression under all conditions (Peters et al., 2007; Mitter et al., 2009). What we can do and should do was screening relative most stable reference genes to keep the results of gene expression with higher reliability. Dianchi golden-line barbel (Sinocyclocheilus grahami) is a freshwater cyprinid fish that endemic in the Dianchi Lake basin in Yunnan province of China (Chu & Gui, 1989). It has now been categorized as a second-class, state protected animal due to a dramatic population decrease by human activities (Pan et al., 2009). In the recent decade, the artificial breeding of this fish had been succeeded (Yang et al., 2007) and many other following studies were also conducted, such as the aquaculture management and conservation (Pan et al., 2010; Pan et al., 2011), the wholegenome sequencing (Yang et al., 2016) and etc. But up to now, gene expression research on this fish is still blank. For better understanding the genes expression pattern of some interesting genes, qRT-PCR was an effective technique that can be used at different developmental stages of this fish. To achieve this goal, reliable internal control genes have to be chosen for standardizing the RNA input. In this study, eight candidate reference genes were used for preferential choose in qRT-PCR at two stages (juvenile and adult) in this study: tubulin beta-4b(Tubb4b), beta-actin(ACTB), glyceraldehyde-3-phosphate dehydrogenase (GADPH), eukaryotic translation elongation factor 2 (Eef2),beta-2microglobulin(B2M), glucose-6-phosphate dehydrogenase(G6PD), ribosomal protein L17 (RPL17), hypoxanthine phosphor ribosyl transferase1 (Hprt1) (Table 1). One user-friendly web-based comprehensive online tool, RefFinder (Xie et al., 2012), which integrates four frequently used methods namely, the comparative delta-CT method (Silver et al., 2006), BestKeeper (Pfaffl et al., 2004), NormFinder (Andersen et al., 2004), GeNorm (Vandesompele et al., 2002) were used to compare and rank the stability of tested candidate reference genes at juvenile and adult stages of S. grahami. Table 1: List of candidate reference genes evaluated in this study. The juvenile and adult fish were obtained from the endangered fish conservation center, Kunming Institute of Zoology, Chinese Academy of Sciences. Juveniles were random selected from the same lineage (from the same father and mother fish) of 5 months old after in vitro fertilization. During larval and juvenile stage, fry were fed twice daily to satiate with egg yolk and fairy shrimps respectively. Adults were collected from the pool that came from the same generation after artificial propagation and fed twice daily to apparentsatiation with a commercial diet (protein 40%, lipid 18%). Twelve juvenile and eight adult fish (four male and four female) were using for sample preparation. The fresh intestine, liver, muscle, brain, heart, kidney, eye, gill, skin and spleen were frozen in liquid nitrogen and then extracted total RNA immediately. Total RNA was extracted from each sample using the TRIzol® reagent (Takara, Japan) according to the manufacturer’s recommendation. To eliminate residual genomic DNA in the preparation, RNA samples were treated with the RNase-Free DNase I (Qiagen). The quality of total RNA was examined by agarose gel electrophoresis and quantified using UV-Vis spectrophotometer (NANODROP 2000c; Thermo Scientific, USA). For qRT-PCR, 0.5 μg of total RNA was used for reverse transcription with a PrimeScript® RT reagent Kit with gDNA Eraser (Perfect Real Time; Takara) in a final reaction volume of 20 μL. The copy number of eight candidate references genes was identified through gene annotation of S. grahami. CDS sequences were downloaded from the National Center for Biotechnology Information (NCBI) database and BLAST was used to find gene identities with zebrafish. As S. grahami is a tetraploid fish, generally, it has two copies corresponding to the single copy gene in zebrafish. For genes which had relatively low similarity among two CDS sequences (exist of deletion or insertion), we used different primers to distinguish them. For those genes which had high similarity between two copies (just exist mutation or SNP) and could not distinguish by primers, we used a pair of primers that suit for combining both of sequences. For one copy gene, we used a pair of primers. Oligonucleotide primers were designed using Primer Premier 5.0 software (PREMIER Biosoft International, CA, USA). All primers were designed to cross at least one intron/ exon border that containing both donor and acceptor sites for avoiding amplification of any contaminating genomic DNA. Polymerase chain reaction (PCR) was conducted using cDNA as template before qRT-PCR reaction. Products of PCR were checked by agarose gel electrophoresis to confirm a single band without non-specific bands or false-positive products, and then using DNA sequencing to check whether the target products were correct or not. All primer pairs were used in gradient reactions for determining their optimal annealing temperatures. After screening, the right primer for every gene was conducted to qRT-PCR reactions. A total of 20 μL volume was performed which containing 160 nM of each primer, 5 μL of diluted cDNA template ( ≈ 2 ng/μL) and 2 × SYBR® Premix Ex Taq™ II (Tli RNaseH Plus; TaKaRa) on the LightCycler 480 (Roche). Each PCR reaction was assayed in triplicate and a no template control (NTC) was included. The three-step qRT-PCR program included an enzyme activation step at 95°C (5 min) and 45 cycles of 95°C (10 s), 57°C (10 s) and 72°C (10 s). Gene expression levels were recorded as CT values that corresponding to the number of cycles at which the fluorescence signal can be detected above a threshold value that was arbitrarily set to 0.3. Five-point standard curves of a 5-fold dilution series (1:1-1:625) from pooled cDNA were used for PCR efficiency calculation. The PCR efficiency (E) was given by the equation E=(10-1/m-1) × 100, where m was the slope of line arregression model fitted overlog-transformed data of the input cDNA concentrations versus CT values (Radonic et al., 2004). Each sample was run in triplicate and the mean CT value was taken as an individual data setting for all statistical analyses including juvenile and adult stages respectively. The CT values were analyzed using the comparative delta-CT method, BestKeeper, NormFinder, GeNorm. The level of statistically significant difference was set at P<0.05. By bioinformatic searching and BLAST to the eight candidate genes, we found Tubb4b, ACTB, GAPDH, G6PD, RPL17 and Hprt1 have two copies while Eef2 and B2M only have one single copy in S. grahami (Table 2). For Tubb4b and G6PD, their two copy sequences have low similarity, so we design different primers to amplify each sequence separately. Electrophoresis results shown that only the high identified copy (BLAST with zebrafish) could get a single band at the expected length, while the other low identified copy amplified either non-specific bands or false-positive bands even though from the copy specific primers (Figures 1A and 1B). Sequencing results also showed single peak and correct base sequence alignment corresponding to the high identity copy. Gene of ACTB, GAPDH, RPL17 and Hprt1, which have high similarities of their two copies, sequences were amplified using a pair of primer that suit for both of them. Table 2: The number of copy in eight candidate genes and their identity to the corresponding genes in zebrafish. 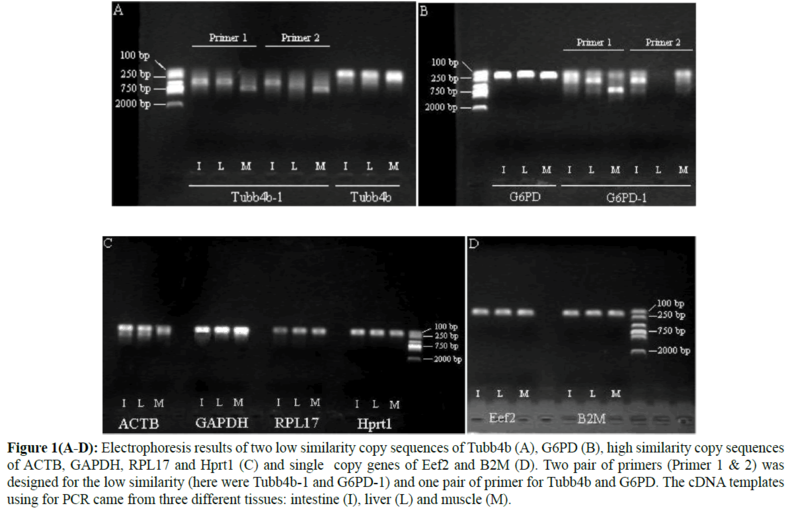 Figure 1(A-D): Electrophoresis results of two low similarity copy sequences of Tubb4b (A), G6PD (B), high similarity copy sequences of ACTB, GAPDH, RPL17 and Hprt1 (C) and single copy genes of Eef2 and B2M (D). Two pair of primers (Primer 1 & 2) was designed for the low similarity (here were Tubb4b-1 and G6PD-1) and one pair of primer for Tubb4b and G6PD. The cDNA templates using for PCR came from three different tissues: intestine (I), liver (L) and muscle (M). Electrophoresis results showed that only one single band was presented (Figure1C) and sequencing results revealed similar phenomena that only the high identified copy has been sequenced for all the base sites were identical to this copy and without any hybrid site (Figure 2). All the above results indicated that there might be only one copy maintained normal function of these important housekeeping genes although the genome sequencing isolated and annotated two different copies. A pair of primer was used to amplify part of CDS sequence of Eef2 and B2M, and both the electrophoresis (Figure 1D) and sequencing results verified a single band with correct sequence. Figure 2: The SNP sites of amplified fragment in high similarity copy sequences of ACTB (A), GAPDH (B), RPL17 (C) and Hprt1 (D) and their sequencing results. Arrowheads denote SNP sites. The primer sequences, amplicon size and the optimal annealing temperatures of eight candidate gene were shown in Table 3. Expression level of each gene in different tissues of juvenile and adult fish was shown in Figure 3. All the standard deviation of CT value between replicates was less than 1. Standard curves exhibited correlation coefficient (R2) higher than 0.99 and PCR efficiencies ranged from 95% to 100% (Table 3). The melting curves for all genes demonstrated a single peak confirming genespecific amplification. Figure 3: Expression levels of eight candidate genes in ten different tissues during juvenile and adult stages of S. graham. Eef2, ACTB and G6PD were the most stable reference genes at juvenile stage according to the comprehensive ranking orders from RefFinder (Figure 4A). For separate software analysis, except BestKeeper, these three genes also perform the most suitable ones but their rankings have some differences: the comparative delta- Ct method and NormFinder (Eef2>ACTB>G6PD) and GeNorm (Actb|G6PD>Eef2) (Table 4). GAPDH was the least stable reference gene no matter using any methods. Figure 4: Expression stability ranking orders of the eight candidate reference genes calculated by the Geomean method of RefFinder. A lower Geomean ranking values indicates more stable expression among different tissues. Table 4: Ranking orders of the eight candidate genes at juvenile and adult S. graham. B2M, Eef2 and RPL17 were the most stable reference genes at adult stage according to the comprehensive ranking orders from RefFinder (Figure 4B). For separate software analysis, all four methods showed that these three genes also perform the most suitable ones but their rankings were different: the comparative delta-Ct method (Eef2>B2M>RPL17), BestKeeper (B2M>RPL17>Eef2), NormFinder (Eef2>RPL17>B2M) and GeNorm (B2M|RPL17>Eef2) (Table 4). The similar results of the least stability of GAPDH were found at adult compare to juvenile stage. In previous studies about reference gene selection in fishes, most objective species were diploids, such as zebrafish (McCurley & Callard, 2008), rice field eel (Hu et al., 2014) and nile tilapia (Wang et al., 2015) and few studies concerned about polyploidy. For most diploids fishes, these common used reference genes were only presenting one copy, so the gene expression analyses using qRT-PCR was straightforward. Even if the reference genes study on the tetraploid Xenopus laevis by Šindelka et al. (2006), they did not take any different gene copies into account after genome duplication. In our study, we use a strategy to design two pairs of primers in distinguishing different copies that with relative low similarity (BLAST to zebrafish), such as Tubb4b and G6PD; and to design the same pair of primers in amplifying both the copies to these relative high similarity genes, such as ACTB, GAPDH, RPL17 and Hprt1. All the results from PCR indicated that there might be only one copy maintained normal function of these housekeeping duplicated genes although the genome sequencing isolated and annotated two different copies. Additionally and interestingly, all these copies being sequenced were these high similarity ones when BLAST to zebrafish. Although the mechanisms of how to retain gene function and which copy is preferred after gene duplication was beyond the aim of this study, at least one pair of primer for each gene was finally verified and picked out for the following qRT-PCR reactions. Generally, the typical reference genes are those expressed highly and stably in most cells under certain experimental conditions (Janssens et al., 2004). Integrating several applications to assess the applicability of different reference genes from alternative methods can make the result more reliably. Previous studies had demonstrated that reference genes could be different under different conditions, in different tissues and during different developmental stages (McCurley & Callard, 2008; Van Hiel et al., 2009; Zheng & Sun, 2011). In this study, ranking stabilities of eight candidate genes exhibited various degrees of expression among ten tissues during juvenile and adult stages no matter which methods were used for evaluation. Similar observations were found in other fish species, such as channel catfish (Small et al., 2008), Atlantic halibut (Fernandes et al., 2008) and fathead minnow (Filby & Tyler, 2007). In present study, the most stable reference genes were Eef2, ACTB and G6PD at juvenile stage while Eef2, B2M and RPL17 at adult stage, which had astability values below 1.0 using BestKeeper, NormFinder and GeNorm. Summarizing the results from four programs by RefFinder, Eef2 was the most stable gene in different tissues at both juvenile and adult stages. Eef2 is a translation elongation factor that promotes the GTP-dependent translocation of the nascent protein chain from the A-site to the P-site of the ribosome (Kaul et al., 2011). In the reference gene selection study of Atlantic halibut, Eef2 presented low stability under different development stages or experimental conditions (Fernandes et al., 2008; Hagen et al., 2009). But based on our data, Eef2 was evaluated as the most stable expression gene in both stages of S. grahami and the mean CT values were also presented minimum changes (15.25 ± 0.33 and 15.95 ± 0.21 at juvenile and adult stages, respectively). ACTB is an essential gene in cellular shape and anchorage where transmembrane glycoproteins link fibronectin in the extracellular matrix with actin microfilaments on the cytoplasmic side of the membrane and often using as a common reference gene in many experiments (Glare et al., 2002, Dundas & Ling, 2012). According to this study in S. grahami, ACTB can also be used as one of the reference genes due to higher stability in juvenile. However, ACTB is not suitable for using as reference gene due to high variation in different tissues at adult fish. Other studies involve in zebrafish and channel catfish have a similar result to rejected ACTB as a reference gene, especially in adult fish (McCurley & Callard, 2008; Small et al., 2008). Although many studies used G6PD as one of candidate genes in the process of selecting reliable reference genes as we do, few results recommended it because of its high variation (Hibbeler et al., 2008; Aursnes et al., 2011). Calculating by GeNorm, ACTB combine with G6PD were recommended as the most stable reference genes to juvenile while not to adult. In Japanese flounder and zebrafish, B2M was known to be one of the most stable genes across different tissue types (McCurley & Callard, 2008; Zheng & Sun, 2011), which was similar to our study in adult fish. RPL17 was listed as a best reference gene when exploring the expression levels of six genes in various Atlantic halibut tissues, both in noninjected fish and in mock- and NNV-injected fish (Overgard et al., 2010). In this study of adult fish, the gene expression of RPL17 among different tissues is also relative stability. GAPDH contributes to diverse cellular functions such as nuclear RNA export, DNA replication, DNA repair, exocytotic membrane fusion, cytoskeletal organization and phosphor transferase/kinase reactions (Sirover, 1999). Compared to other species, GAPDH was identified less frequently as reference genes for qRT-PCR in some published studies on fish (Olsvik et al., 2005; Tang et al., 2007; Olsvik et al., 2008; Zheng & Sun, 2011). The similar result also found in the fish of our study, GAPDH exhibited variation seriously among different tissues in both development stages using four different methods, which suggested it might be the least suitable reference gene in S. grahami. As far as we know, this is the first report about the reference gene selection in Sinocyclocheilus fishes. The species in this genus were served as an emerging cavefish model (Yang et al., 2016) that it can be expected more and more researches were conducting to this group of fishes in the future. As a natural group of tetraploid fishes, designing appropriate primers for distinguishing different copies was the very fundamental step before the qRT-PCR analyses. The strategy we used in this study may provide some reference to the coming researches. Screening eight candidate reference genes in S. grahami indicated that Eef2, ACTB and G6PD to be the most stable reference genes and could be used as the suitable internal controls in juvenile, and Eef2, B2M and RPL17 were considered to be the most reliable reference genes for accurate qRT-PCR in adult fish. We thank the members at the endangered fish conservation center, Kunming Institute of Zoology and the colleagues in the State Key Laboratory of Genetic Resources and Evolution, Kunming Institute of Zoology for their help to conduct the experiment. This study was supported by the Basic Research Program of Yunnan Province (2016FA044 to Yang, J.X., 2012FB183 to Pan, X.F. ); the Yunnan Biodiversity Protection Program, a major program of the Chinese Academy of Sciences (Y206B51181); CAS “Light of West China” program to Wang. X.A. and Pan, X.F. Andersen, C.L., Jensen, J.L., Orntoft, T.F. (2004) Normalization of real-time quantitative reverse transcription-PCR data: a model-based variance estimation approach to identify genes suited for normalization, applied to bladder and colon cancer data sets. Cancer Res 64, 5245-5250. Araya, M.T., Siah, A., Mateo, D., Markham, F., McKenna, P., et al. (2008) Selection and evaluation of housekeeping genes for haemocytes of soft-shell clams (Myaarenaria) challenged with Vibrio splendidus. J of Invertebrate Pathol99, 326-331. Aursnes, I.A., Rishovd, A.L., Karlsen, H.E., Gjoen, T. (2011) Validation of reference genes for quantitative RT-qPCR studies of gene expression in Atlantic cod (Gadusmorhua L.) during temperature stress. BMC research Notes 4, 104. Bustin, S. (2002) Quantification of mRNA using real-time reverse transcription PCR (RT-PCR): Trends and problems. J MolEndocrinol29, 23-39. Bustin, S., Benes, V., Nolan, T., Pfaffl, M. (2005) Quantitative real-time RT-PCR-a perspective. J MolEndocrinol34, 597-601. Chu, X.L., Chen, Y.R. (1989) The fishes of Yunnan, China Part I Cyprinidae. Science, Beijing pp: 135-229.
de Boer, M.E., de Boer, T.E., Mariën, J., Timmermans, M.J., Nota, B. (2009) Reference genes for QRT-PCR tested under various stress conditions in Folsomia candida and Orchesellacincta (Insecta, Collembola). BMC MolBiol10, p: 1. Dundas, J., Ling, M. (2012) Reference genes for measuring mRNA expression. Theory In Biosciences 131, 215-223. Fernandes, J.M., Mommens, M., Hagen, O., Babiak, I., Solberg, C. (2008) Selection of suitable reference genes for real-time PCR studies of Atlantic halibut development. Comparative Biochem and Physiol Part B 150, 23-32. Filby, A.L., Tyler, C.R. (2007) Appropriate'housekeeping'genes for use in expression profiling the effects of environmental estrogens in fish. BMC MolBiol8, p:1. Glare, E, Divjak, M., Bailey, M., Walters, E. (2002) β-Actin and GAPDH housekeeping gene expression in asthmatic airways is variable and not suitable for normalising mRNA levels. Thorax 57, 765-770. Hagen, O., Fernandes, J.M., Solberg, C., Johnston, I.A. (2009) Expression of growth-related genes in muscle during fasting and refeeding of juvenile Atlantic halibut, Hippoglossushippoglossus L. Comparative Biochem and Physiol Part B 152, 47-53. Hibbeler, S., Scharsack, J.P, Becker, S. (2008) Housekeeping genes for quantitative expression studies in	the three-spined stickleback Gasterosteusaculeatus. BMC MolBiol9, p: 18. Hu, Q., Guo, W., Gao, Y., Tang, R., Li, D. (2014) Reference gene selection for real-time RT-PCR normalization in rice field eel (Monopterusalbus) during gonad development. Fish Physiol and Biochem40,1721-1730. Janssens, N., Janicot, M., Perera, T., Bakker, A. (2004) Housekeeping genes as internal standards in cancer research. Molecular Diagnosis 8,107-113. Kaul, G., Pattan, G., Rafeequi, T. (2011) Eukaryotic elongation factor-2 (eEF2): its regulation and peptide chain elongation. Cell Biochemistry and Function 29,227-234. Kortner, T.M., Valen, E.C., Kortner, H., Marjara, I.S., Krogdahl,A., (2011) Candidate reference genes for quantitative real-time PCR (qPCR) assays during development	of a diet-related enteropathy in Atlantic salmon (Salmosalar L.) and the potential pitfalls of uncritical use of normalization software tools. Aquaculture318,355-363. Kubista, M., Andrade, J.M., Bengtsson, M., Forootan, A., Jonák, J et al. (2006)The real-time polymerase chain reaction. MolAspects Med27,95-125. McCurley, A.T., Callard, G.V. (2008) Characterization of housekeeping genes in zebrafish:male-female differences and effects of tissue type, developmental stage and chemical treatment. BMC MolBiol9, p:1. Mitter, K., Kotoulas, G., Magoulas, A., Mulero, V., Sepulcre, P. (2009) Evaluation of candidate reference genes for QPCR	during	ontogenesis and ofimmune-relevant tissues of European seabass (Dicentrarchuslabrax). Comparative Biochemistry and Physiology Part B153,340-347. Morga, B., Arzul, I., Faury, N., Renault, T. (2010) Identification of genes from flat oyster Ostreaedulisas suitable housekeeping genes for quantitative real time PCR. Fish &Shellfish Immunol29,937-945. Nicot, N., Hausman, J.F., Hoffmann, L., Evers, D. (2005) Housekeeping gene selection for real-timeRT-PCR normalization in potato during biotic and abiotic stress.J ExpBot56,2907-2914. Olsvik, P.A., Lie, K.K., Jordal, A.E.O., Nilsen, T.O., Hordvik, I. (2005) Evaluation of potential referencegenes in real-time RT-PCR studies of Atlantic salmon. BMC MolBiol6, p:1. Olsvik, P.A., Søfteland, L., Lie, K.K. (2008) Selection of reference genes for qRT-PCR examination ofwild populations of Atlantic cod Gadusmorhua. BMC Research Notes1, p: 1. Øvergård, A.C., Nerland, A.H., Patel, S. (2010) Evaluation of potential reference genes for real time RT-PCR studies in Atlantic halibut (HippoglossusHippoglossus L.); during development, intissues of healthy and NNV-injected fish, and in anterior kidney leucocytes. BMC MolecularBiol11, p: 36. Pan, X.F., Chen, X.Y., Yang, J.X. (2009) Threatened fishes of the world: Sinocyclocheilusgraham (Regan) 1904 (Cyprinidae). EnvironBiolFish85,77-78. Pan, X.F., Yang, J.X., Chen, X.Y., Li, Z.Y. (2011) Broodstocks management, fecundity and therelationship between egg size and embryo survival ability of Sinocyclocheilusgrahami. ZoologyRes 32, 196-203. Pan, X.F., Yang, J.X., Li, Z.Y., Chen, X.Y. (2010)Feeding changes and growth performance ofSinocyclocheilusgrahami (Pisces, Barbinae) larvae and juveniles in farm environment. ZoologyRes 30, 433-437. Peters, I.R., Peeters, D., Helps, C.R., Day, M.J. (2007) Development and application of multiple internalreference (housekeeper) gene assays for accurate normalisation of canine gene expression studies.VeterinaryImmunol and Immunopathol117,55-66. Pfaffl, M.W., Tichopad, A., Prgomet, C., Neuvians, T.P. (2004) Determination of stable housekeepinggenes, differentially regulated target genes and sample integrity: BestKeeper–Excel-based toolusing pair-wise correlations. Biotechnology letters 26,509-515. Radonic, A., Thulke, S., Mackay, I.M., Landt, O., Siegert, W. et al. (2004) Guideline to referencegene selection for quantitative real-time PCR.Biochemical and Biophysical ResearchCommunications313,856-862. Silver, N., Best, S., Jiang, J., Thein, S.L. (2006) Selection of housekeeping genes for gene expressionstudies in human reticulocytes using real-time PCR. BMC Molecular Biol7, p: 1. Šindelka, R., Ferjentsik, Z., Jonák, J. (2006) Developmental expression profiles of Xenopuslaevisreference genes. Developmental Dynamics235,754-758. Sirover, M.A. (1999)New insights into an old protein: the functional diversity of mammalian glyceraldehyde-3-phosphate dehydrogenase. Biochimica etBiophysicaActa (BBA)-ProteinStructure and Molecular Enzymology1432,159-184. Small, B.C., Murdock, C.A., Bilodeau-Bourgeois, A.L., Peterson, B.C., Waldbieser,G.C. (2008) Stability ofreference genes for real-time PCR analyses in channel catfish (Ictaluruspunctatus) tissues undervaryingphysiological conditions. Comparative Biochem and PhysiolPartB 151,296-304. Suzuki, T., Higgins, P., Crawford, D. (2000) Control selection for RNA quantitation.Biotechniques29,332-337. Tang, R., Dodd, A., Lai, D., McNabb, W.C., Love, D.R. (2007) Validation of zebrafish (Daniorerio)reference genes for quantitative real-time RT-PCR normalization. ActabiochimicaetbiophysicaSinica39,384-390. Thellin, O., Zorzi, W., Lakaye, B., De Borman, B., Coumans, B. et al. (1999) Housekeeping genes as internal standards: use and limits. J Biotechnol75,291-295. Van Hiel, M.B., VanWielendaele, P., Temmerman, L., Van Soest, S., Vuerinckx, K.(2009) Identification and validation of housekeeping genes in brains of thedesert locust Schistocercagregaria under different developmental conditions.Bmc MolecularBiol10, p:1.
internal control genes. Genome Biol3, p: 1. Wang, E., Wang, K., Chen, D., Wang, J., He, Y. (2015) Evaluation and selection of appropriate reference genes for real-time quantitative pcr analysis ofgene expression in nile tilapia (oreochromisniloticus) during vaccination and infection. International JMolecular Sci16, 9998-10015. Xie, F., Xiao, P., Chen, D., Xu, L., Zhang, B. (2012)miRDeepFinder: a miRNA analysis tool for deepsequencing of plant small RNAs. Plant Molecular Biol80,75-84. Yang, J.X., Pan, X.F., Li, Z.Y. (2007) Preliminary report on the successful breeding of the endangeredfish Sinocyclocheilusgrahami endemic to Dianchi Lake.Zool Res28, 329-331. Yang, J.X., Chen, X.L., Bai, J., Fang, D.M., Qiu, Y. et al. (2016) TheSinocyclocheilus cavefish genome provides insights into cave adaptation. BMCMolBiol14. Zheng, W.J., Sun, L. (2011) Evaluation of housekeeping genes as references for quantitative real timeRT-PCR analysis of gene expression in Japanese flounder (Paralichthysolivaceus). Fish &Shellfish Immunol30,638-645.